"D o you think it's straight?" "I think there's no point working on this anymore today. I just can't seem to get online with it". Erich Schiffmann's phrase 'Get Online' had clearly made an impact around our house. My husband loved Schiffmann's analogy of getting online as a way of understanding the silent mind, and has since adopted the phrase into his own vernacular. And we're not the only ones that have found that Erich's ideas stick. An internationally renowned teacher, Erich Schiffmann is a dedicated practitioner whose subtle classes are a reflection of a skillful, meditative silence, and an immediate, spontaneous approach to movement and group practice. 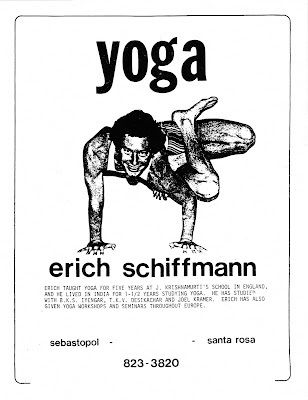 Erich Schiffmann is an accomplished American Yoga Master widely known for his award-winning video, Yoga Mind & Body, featuring actress Ali MacGraw. He is the author of a best-selling book, Moving into Stillness. 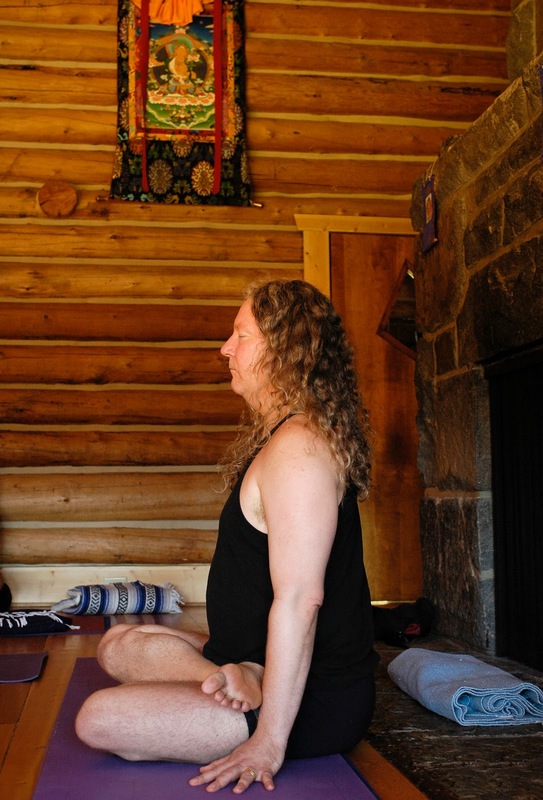 He has been teaching yoga for more than thirty five years. 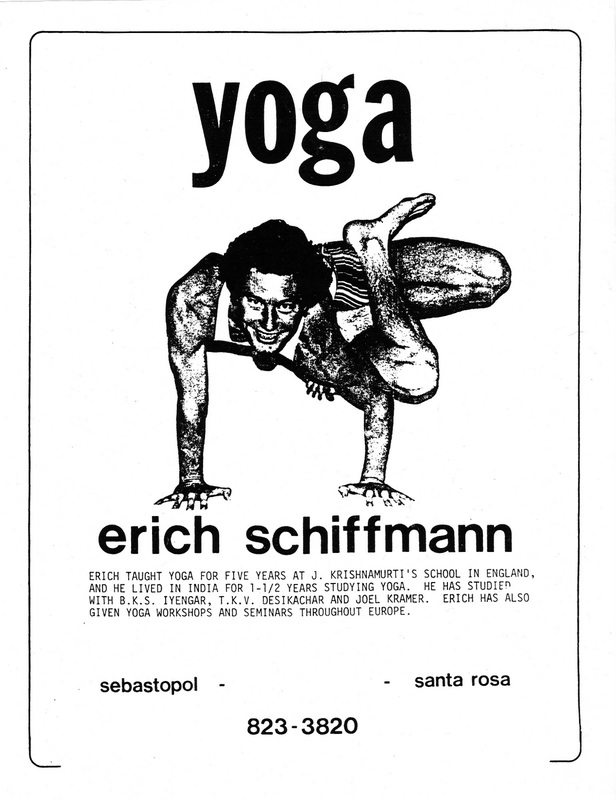 At age 18 Schiffmann sent a handwritten letter to Jiddu Krishnamurti and was accepted to study with him in England. He deepened his practice of yoga with Desikachar and BKS Iyengar in India, and with Dona Holleman and Vanda Scaravelli in Europe. 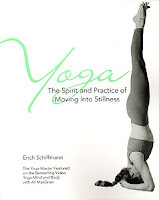 Yoga Society president Leighanne Buchanan called Schiffmann one of the "innovators" in Yoga Journal's fall 2000 issue. He has produced numerous yoga instructional videos and conducts yoga workshops and teacher training throughout the United States and internationally. I stopped in on Erich, his wife Leslie Bogart (a registered nurse/yoga instructor) and their dog Bella at their home in Santa Monica, where Erich has a lovely yoga sanctuary off the back garden of the main house. Given that Erich is a maverick filmmaker, I should have known that our interview would likely be captured to dvd. A few of those clips are featured on the left hand sidebar of this site. 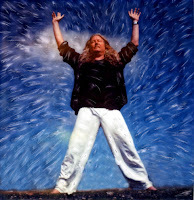 Erich and I had a chance to chat about what it means to get online, free-form yoga, his years of study with Krishnamurti, Iyengar and Vanda Scaravelli, and everything else including discipline, creativity, surfers and Christ. Priya: So Erich, what's it like living out here? Erich: I like it here, actually. I grew up here, so I'm used to here. But then I moved away for a long time, moved to England first. Priya: Was that because your family moved to England? Erich: No. I'd been reading Krishnamurti books. Erich: I went to meet him, essentially. And I liked England because there was weather. The first year I liked it because there was weather. Like, here there aren't really any real seasons. England was fun that first year because it was sort of new for me. But then with each year that I was there, the winter seemed longer and longer. So I moved all around, I came back here. And I like it here. It's mild. And I travel a lot anyways, so I get to experience a lot of variation. Priya: Sure. Because you travel so much, would you say that there was a specific character to yoga in LA? Erich: Yeah. I'm curious what you would say about that also, because I'm so inside it I don't really know what's going on here actually. I go to my class. I know there are other teachers here. I know it's a big centre for yoga, but I don't really know what the latest thing is. I know it changes. Erich: There's trends, yeah. And my trend has been so different I think. I mean, I've been teaching now for 37 years. To me, it seems like I'm always doing the same thing with micro, micro, micro, micro, micro slow movement. But essentially it feels the same. But someone looking at me, someone who would come to my class a year ago and then comes now, to them they'll notice how much further it's gone. Erich: For one, I never used to talk in class. I used to save that for workshops. And then a couple years ago it just shifted and now the thing to do for me is talk. And if I try to run the class the way I used to run the class, it would just feel like I was going backwards. In a sense I wish a class could be three hours so that I could talk, give instruction, have time for free form, have time for silent meditation; stuff like that. But because the classes are so short, an hour an a half. A lot of the time starts late, so it ends up being about an hour and 15 minutes usually. I can't get everything in, and so I'm just doing what seems to be the most interesting thing for me, which at the moment is the mind talking part. So I'm enjoying that. And there's less resistance in the psychosphere to that now. Yeah. So people are liking it, people are liking the free form now. Priya: And you found that there was resistance to that before? Erich: Initially there was a resistance to the free form. I mean, I was explaining, OK, we're going to do free form. And essentially what that is is sort of like Mysore style, except where you do your own practice. Instead of performing a prescribed routine, you "get online" and you just do your best to let go of what you think you're supposed to do and listen for what to do. Listen for inner guidance and be brave enough, like, give yourself permission to do what's coming through. Priya: I guess you are! Erich: Yes, exactly. [laughs] And it's worth every penny. [laughs] But years ago I tried to initiate free form in class and someone said something similar to that. They said, “Look, the reason I come to class is for you to tell me what to do.” You know, “I don't want to think about it,” was the line. “I don't want to think about it. I want you to tell me what to do.” And I remember just totally falling for that. Like, oh, right. Oh, you're right. And that's sort of squished my enthusiasm for doing free form in class for years because my job was to tell them what to do. Finally, I got to wow, yes, what I'm actually telling you to do is don't just listen to the human teacher about what to do. Don't even think about it. Like, don't worry about thinking of what to do. And instead – I like the online image – get online and listen for what to do. And as soon as I was clear on the fact that, wow, I'm telling the person to listen, not to me – though it will feel similar, actually – but to listen to themselves about what to do. Then I was clear about why it was an important chapter. I was clear that I wasn't running from my responsibility. And actually I was answering it, being more responsible by providing the time where we can be online and practice together. And therefore the "I'm paying for this" story, becomes a valuable, important chapter. And as soon as I got clear on that, I was able to then pull my class off despite other people's objections, whether they were voiced or not. As long as I was able to just stay clear, more and more people got into it. And then those who were still not into it found it harder to resist. And now it's like a free form chapter, it's like, “That's free form!” Like, it's the favorite chapter. Priya: Yeah, it's not articulated. Priya: Do you think the length of classes right now is too short to be able to give that kind of experience or communicate the experience with people? Erich: I don't actually think that, no. Because in any one class, it seems like people can only get so much at a certain time anyway. They've got to keep coming, they've got to keep coming, keep coming... And so it's additive, as it adds up they'll get everything they need to know. And it's better to end and have it a little too short than a little too long every time. But when I was making the shift into the freedom style or the guided from within experience, no one in my world was really talking about it. And it was like really confusing for me for a couple years because I'd been very disciplined and loved it. Like, I loved the disciplined, structured stuff I was doing. If it hadn't been so disciplined and specific about what I was supposed to do, I probably wouldn't have gotten into it sufficiently. Priya: Do you think if someone had said it, you would have heard it? Erich: I don't know. I don't know. If someone had said it, I would have heard it at some point. I think that if they said it earlier, I wouldn't have heard it because I was still so into the structure. I think I would have classified it as being flakey or something like that. Priya: Yeah. This is a much broader question, but can you discern now so many years later what it was that even made you curious about yoga? I mean, writing a letter to Krishnamurti? I mean, first of all you're reading Krishnamurti at a young age. Erich: I was a teenager, yeah. Priya: Which is unusual, right? Wouldn't you say? Erich: Oh, yeah. Yeah, yeah. Priya: So what drew you to even reading Krishnamurti? And what made you actually write to him? Erich: I was just interested in the spiritual stuff from young. That was sort of my natural inclination. I didn't especially want to bend over and touch my toes. I didn't want to do that. But I was totally interested in like trying to figure out what's going on and what is life. I was just reading every spiritual book I could get. At some point my best friend gave me a Krishnamurti book. And I remember thinking, wow, that's the best book I've ever read. And I just read nothing but Krishnamurti for years. And I wrote to the school to see if I could come and be a student there. I wanted to meet him. I wanted to meet other people that were into him. I wanted to eat like him. I wanted to do yoga like him. You know, it was sort of like I wanted to study this guy. It was sort of his influence in a way. Like, he never talked about yoga very much. Like, in public he sort of put it down. Somewhat anyway...He was a yogi, but he wasn't vocal about it essentially. But he did it three hours a day. Priya: Why do you think he wasn't vocal about it? Erich: Well, he wasn't big on techniques. I think he didn't want to push it as a thing to do as a way of becoming different. It was more about just being aware. Something like that. But he did say at some point, if you want to get your head together and understand what I'm talking about, it helps if you meditate, do yoga, and become a vegetarian. So I was happy to hear that he thought that. And, OK, so I did all that. Priya: So did you start meditating at that age? Or were you meditating before? Erich: I had before already, yeah. Priya: Did you find it hard to meditate at the beginning? Did you come from a traditional background where that was either encouraged or practiced? Priya: So a little bit unusual, then? Erich: A little unusual. I joined the SRF, the Self Realization Fellowship, Yogananda. Erich: I joined their club, their organization. I think I was 14 when I signed up for that. Because I remember when I was 15, I took a bus to Encinitas, which is south of here. That's where their big ashram on the cliff is. I remember I wasn't old enough to drive yet, so I took the bus in order to do a weekend retreat at Yogananda's ashram. So I must have joined when I was 14, reading his books. Their thing was the four or five gurus, whatever. And I had their pictures up on the wall above my head in my bedroom. You know, Yogananda, Yukteswar, whoever they were, Babaji. And Dad thought I was a nut. Erich: You know what I mean? Mom was more about it. She probably thought I was a nut, too, but she, whatever... So no, it wasn't a part of my family. Actually what it was, I grew up here and I was a surfer. So it was like all my surfing idols were into Yogananda. And I just started copying them about what was cool. So that sort of thing. Priya: You talk about not being interested in touching your toes... So at what point did you become interested in the physical practice? Erich: Yeah. Well, my older brother gave me a yoga book for my birthday. And I remember thinking, what a stupid birthday present. Erich: It was beginning to morph that way. But it didn't actually kick in until I went to Krishnamurti's school in England and had my first yoga teacher. So I had class there and then went to India. 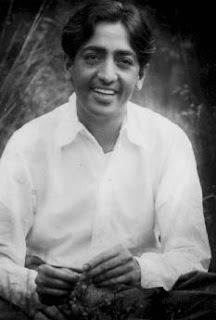 Priya: What did you learn from Krishnamurti? Erich: [laughs] Yeah. See, that's fun. (pauses) He was a lovely man. Did you ever meet him or see him? Erich: The thing that was interesting about him was like he was just in the room. He wasn't like an overpowering presence. He was sort of quiet, shy. Beautiful. Beautiful. And like there was a line to get the food. He'd go last, type of thing. He'd be like, “You go first.” He would call me Old Boy. “Good morning, Old Boy.” I think he just couldn't remember my name. Erich: But I think what I liked about him was that he was so human in person, but then when he got up there on stage and started talking it was like, [makes explosion sound]! It was just the same guy, but suddenly this whole transmission would start coming through. Priya: So do you think it has something to do with that word you used in class, about being a "channel"? Erich: Yeah. Mn hm. Was that the class where I was saying what I thought about channeling? Or did I just use the word channel? Priya: No, you talked a bit about what it meant to channel. I found it quite interesting. People always say that Krishnamurti had a lot of presence. I've always wondered about that word. But then the word being present is actually in the word. So I wondered when you met him whether you actually found that he was quite present. Erich: Yeah. Like, what do the teachings look like in person? [laughs] So I positioned myself in the dining room to where I could see him. He came in. And I saw him sort of looking around, you know, sort of looking around. And then our eyes caught and he went, he just kind of gave me this salute like that. And I was like, [makes noise]. And it was like I got this feeling of, wow, he was sort of like deliberately looking for me, is what it seemed like. And then I saw him seeing me. And just that moment... I was different suddenly. I had been seen by the sage. You know? And I wasn't rejected. In fact, he had seen through my presentation, sort of seen through the ego presentation and saw me and went, [breathes out]. Sort of like his version of Namaste. And it was like, I see you, type of thing. And it zapped me. And it was like, that was huge. You know, no words, three seconds, day one. Priya: So, obviously profoundly influential. Erich: Yeah. And the teachings were sort of on top of that. And the teachings essentially were just making awareness, you know, just be attentive. Consciousness being conscious. Priya: Is teaching equivalent to instruction? Is that what teaching is? Erich: I don't think so, but it's largely at that level at this point around here. Or at least on the planet. And it serves a purpose. And if it works, it will grow out of itself. I think there needs to be more voicing of the fact that the instructions are to help you get into the experience. The instructions should really be about helping you get into your actual now experience. Like, feeling the life force, life live. And then letting it do its thing through you...which is what I was calling channeling. Except you're not really channeling it, but at that point you're voluntarily the expression of it. Priya: I read a previous interview in which you talked about your experience with Desikachar as a teacher, where he would just talk to you about the weather relentlessly unless you actually asked for what you needed. So, once you figured out you needed to ask the questions, you designed your own curriculum. So you're self teaching, "svadhyaya". Priya: And I thought about whether that was really kind of what you're trying to do now in terms of offering a space where people can do the same thing with free form. Priya: You talked about receptivity as opposed to, and I'll call it a acquisitiveness, in terms of trying to listen. What is the difference? And can you describe a difference in how you feel when you're being receptive as opposed to when you're being acquisitive? I think a lot of people maybe don't have a sense of how that should feel. What should that experience be like? Erich: Receptive is just like... Well, the way I talk about it is not making up your own mind about things. That's the reason teaching is helpful and discipline is helpful. 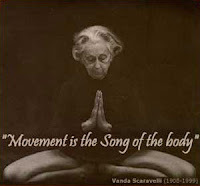 When Iyengar said stretch it just like that, the reason that was helpful was it helped override my conditioning. It taught me how to do something skillfully. And it was obvious to him whether I was doing it. And it wasn't just my conditioning. I was trained a little bit. When I was a kid, we had a piano in our house. I had no lessons. And I'd go on the piano and [makes noises]. So, you go through the training. Learn the notes, learn songs, get really good at clear notes. And get so good at it that you then are giving expression to it. So I'm not sure if I'm getting towards your question. Priya: I think so. I think it sounds to me like what you're trying to say is that receptivity comes when you have a certain level of skill. Erich: Yeah. The thing about like freedom style yoga, or just trusting yourself as a human being, is that the idea is to dare to trust your deepest impulses about things. Now, at first that didn't make sense to me. Like, it didn't – I wasn't so sure I should trust my deepest impulses about things. I wasn't so sure that I should encourage someone else to dare to do as their deepest feelings were guiding them to do. Because who knows what evils lurked in their depths, was sort of the idea. But the more I meditated, the more I did all the stuff, you begin to realize that you only exist because the totality is erupting as you. You're only here because the infinite is infinitely individuated. The reason it makes sense to trust your deepest impulses, therefore, is because you're your closest contact point to the supreme. And again, once I got that, then it made sense. Oh yeah, the smartest thing to do always is like let go of what I think I'm supposed to do so that I can sense what the deepest movement is, knowing that the deepest impulse is the totality in specific expression. Then that will always be the smartest thing. Erich: I'm just increasingly happy with the fact that the smartest thing to do is to trust yourself. Because you have nothing to do with you. You are the supreme being you. Don't make up your own mind. Use your mind to get online. Listen for what to do. And when you listen for what to do, the online knowing registers with you as being your common sense. Priya: Would you say that takes years of practice? Erich: But I think it can be sped up. I don't think it takes as long as it took me. And I think it's sort of up to the teachers who are getting this to be able to say it better. You can't argue with the fact that you're conscious. Like, you've got to be conscious to even argue that you're not conscious. You are conscious, you didn't make yourself conscious. And like that, sort of again realizing, oh wow, I'm not responsible for my existence. It's not up to me to figure everything out. It's up to me to feel what the truth is. Wow, the totality is consciousness as being conscious. And the fact that I'm conscious means that I'm connected to the internet of mind. And therefore instead of using my thinking to navigate my way through life, all I've got to do is keep my GPS system on. Which is inevitable because you're conscious. If you think less and just listen more, then the wisdom of consciousness will be your obviousness, your common sense. So that is sort of what I'm excited about lately. You're conscious, you have nothing to do with it. And if you learn to think less, then knowing comes out. I used to think you had to think in order to come up with knowing. But maybe actually stop thinking, listen, be receptive, you can just slow it down a little. Priya: Does this have something to do with being creative? Priya: Are you cultivating insight instead of knowledge? Erich: Yes. Yeah. Krishnamurti used to talk about thinking as the regurgitation of the past. So thinking sort of like keeps you in the known. And if you're able to just suspend it. And it's not as hard as I always thought it would be. If you just suspend it, you'll still be conscious. And then the nature of being, of consciousness, is the movement of creation. You know what I mean? Like, be creative. And it feels good to be fulfilling your function to be the place where creativity flows through. Priya: To get specific, how do you think that impacts your way of looking at things? 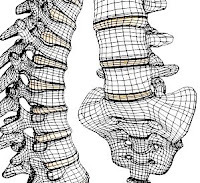 Does it impact the way you might make physical adjustments on students? Erich: It's like their thinking self was being imposed on your presence. 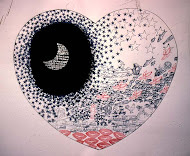 Priya: Yes, or like there's an anatomical map that's being transposed onto experiences and energies. But then it's a lot of responsibility for a teacher in the first place to be able to engage with a student that way. Erich: And if the teacher was more online, then they wouldn't be imposing the map on you. They would be in relationship with you without imposing the map, the past, the desired. And they would then find themselves adjusting you or not adjusting you, or maybe just sort of being in your area. And that would be all it would take for the person to feel like a self correction occurred. Priya: Right. 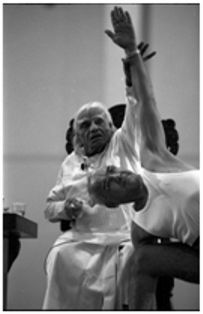 When you studied with Iyengar, what was that training like? Erich: His training was very much about "doing exactly what I'm saying". But he's like totally free in his practice. I used to go and watch him practice every morning and I wrote down everything he did, trying to sort of figure out the syllabus, the sense of what he did. And there was no apparent logic to it. And yet when he teaches, it's do this, do this, do this, do this. And if your eyes even wander, he [makes explosion sound]! Like, he's very Rajasic when he teaches. You think he's angry. And he is, sort of. I mean, you think he is. He fools everybody enough to where they're attentive. And for me at that time, it was really good. I liked him when he was shouting at me because he was giving me his attention. And it was like he was helping me bust my conditioning. Erich: I totally trusted him, yeah. Yeah. I saw him shouting at somebody once, like, fierce! The person probably broke down and started crying. And he sort of smiled to himself. Like, he wasn't really angry. It was just a way of breaking their conditioning. I tried to teach like that. It's not my way, but I tried to teach like that. After I'd been in India, after I'd been with him in India, I went back to the Krishnamurti school and was teaching yoga there. It was mostly teenagers and it's like high school. And I wasn't much older than them and I'd been a student at the school. So it was like a student now being a teacher. And there I was trying to do my best Iyengar imitation. You know, just slapping people and trying to be fierce vocally. And one day this one kid, after many classes of me sort of like slapping his knee to pull his kneecap up in Trikonasana. The kid finally [makes explosion noise], just hopped up and totally slugged me. [makes explosion noise] And I got it. You know, I knew what he meant and it changed my ways. And ever since then, I just sort of went, OK, if I'm going to pull this off and be a teacher, I can't be copying Iyengar or copying anybody. But Iyengar was very fierce, very Rajasic. And I liked it because it made me be attentive. My limiting thought at the time was I sort of thought that he really meant your hands should always be like that. And maybe he was meaning that, but after 10 years I realized, it was more than that. Priya: And yet you saw a kind of spontaneity when he was practicing that he didn't articulate. Erich: Exactly. Exactly. Right. And I even asked him about it or somehow, and his comment at the time was like he was the only one who was sensitive enough to actually be creative in it. Priya: A skill, I guess. Erich: Yeah. And sort of in a sense, you know, if you go to his class, you should do what he says. You know, like you're there to learn. I surrender if he says “Put your hand like that.” OK. OK. Yes! And if I don't like it, I'll go home and do something else. But in that moment there's something valuable about letting go of what I think the right way to do it is, open myself to the teachings of the teacher, try it out. And it was good for me. And if I had only understood at that time that, yes, he's actually being creative. He's not insisting on this for himself. It's just a certain level, like what we said before. And then once you get it, then the inner feeling starts dictating the alignment. So at that part, I'm totally into alignment and all that, but now it's intuitive. And it's harder to teach. Priya: To get present in all those areas. Erich: Exactly! Yeah, exactly. But then not be limited to the form, which is where most people get stuck. And they don't give themselves freedom to then erupt. Erich: Please lock your bicycle. Priya: Oh, yeah. But the last one was intriguing. And I don't think you made any comment about it, which was about yoga not being mechanical. Priya: Was there any context? Erich: There probably was, but I wasn't aware of what it was. He was talking to somebody else. I was probably riding up on my bike and I overheard him say that. Priya: It's a very interesting thing for you to have heard. Especially, in the context of your life, and what you've done. Priya: Krishnamurti and Iyengar, are an interesting pair to have had as teachers. They likely had very different styles of instructing or imparting knowledge. Erich: Oh, they're very different. And I was with both of them at the same time, in the same seven or eight year chapter. And so it was, you know, how do I mingle these together? Krishnamurti himself had done privates with Iyengar for like 20 years, so he'd done yoga with Iyengar for a long time. But they were philosophically very different. Krishnamurti was more like, don't copy anybody. 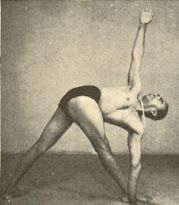 And Iyengar was, copy the best. And that was sort of like a quote from him. Erich: Yeah. And to me that was just totally confusing. Don't copy, copy the best. Don't copy, copy the best. And yet, there's a wisdom in both. You know? Priya: So all roads lead to Rome. Priya: This is going to sound a little bit unusual, but what was Krishnamurti's voice like? Did his voice have an effect on you? Erich: Oh, yeah. Yeah. I don't know, he was just such a – he was a beautiful man. And his words came out of that. And we got to hang out with him a lot at the school in a way that most people don't. Three times a week. We'd all sit in the room, it was a round room, and he'd sit there. And he was in his late 70s at that time. And he would usually come in and say, you know, like what should we talk about this morning? You know? He didn't really have an agenda. It was just like, what would you like to talk about? He'd start talking and answering everybody's question. And you could raise your hand to interrupt at any point. It was fun. And when I was there, there were 50 students at the school. That's a small school. I mean, 50 students, 50 teachers. So 100 people in this community living there. He lived there. Priya: What do you think was convincing about your letter to them? Erich: I was one of the few students, teenagers, who was wanting to come to the school. Most of the students that were there were children of parents who were interested in the teachings. So they were like being sent away to boarding school. And so they were getting a student from California who was wanting to be there. To them it was like, yay! You know? Yay, a student that wants to be here voluntarily! But I remember writing the letter still...hand written...putting it in the mail box and sort of like making a wish as I put it in there. And at the time not knowing, would anyone ever get the letter? Priya: You were probably online to begin with. Erich: Yeah. Yeah. And that seems key, like being willing to do stuff that you don't really know what the payoff or how it's going to turn out. My father thought it was nuts. Go to a Krishna-what school? You know? Priya: Yeah. It's quite a story. I'm sure you've heard that before. You also met Vanda Scaravelli? What was she like? Erich: She was like a female Krishnamurti. An Italian. Contessa? Is it a Contessa? Erich: Something like that. I wrote her a letter. I was going to Italy to study with Dona Holleman. And I wrote Vanda. And she said, “I'll pick you up at the train station. I'll be the little lady with the red turban on.” So this thin woman, she was in her 70s probably, wearing a turban, and little flip flops came up and picked me up and we got in her Mercedes and drove off into the hills. And she was awesome. Erich: She liked to lay in the sun. Had beautiful yoga practice. She had studied with Iyengar for a long time. They were close friends. But she was already at the place where she was free forming it. You know, she was doing her own yoga. She was giving expression to how the energy was going to move. And I remember I was doing something and she said, “Oh, you've got to put more feeling into it, more joy into it.” And I was like, oh, yeah. OK. "Just like more love into it, not just bend yourself, do everything just right. Be a little softer, put a little more breath, put a little more love into it." Erich: Yeah. Yeah, I feel lucky to have met her. Priya: It doesn't sound really like luck though.There's something unusual about it. Erich: You look back and you see how it played out. But at the time, you know, like you don't know where you're going or what's going to happen. 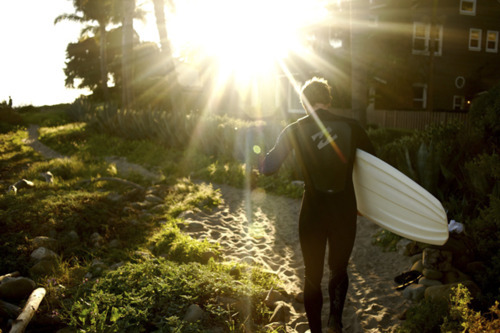 You just kind of keep your balance on the surf board and you just keep going for the ride. Priya: Was it hard to manage that uncertainty, or were you comfortable with it? Erich: I was OK with it, actually, because my guiding thing was I didn't want to end up like my father. He wanted to be a singer and an actor. He had a beautiful voice and he did do singing. But he had four kids and he had to have a job and he had to go to work. And it was sort of like, it squished him. It made him angry, basically, and sort of pissed off. And I didn't want to end up like that. That was sort of my thought. God, I love Dad, but I don't want to end up in a predicament to where I'm pissed off at life about my life. And so whenever there was any sense of me doing something I didn't want to do, like Dad, I would quickly start to step back. It made me like stay on the balance beam of doing what I wanted to do. It helped me clarify, well, what do I want to do? I want to learn yoga, I want to meet Krishnamurti, I want to get clear on this stuff. I don't want to die feeling like I didn't go for it. And that I did time doing stuff that I didn't really want to do. And yet you've got to make a living somehow. Like, somehow you've got to pull it off. But it's sort of like, if you've brave enough to stay on the heart beam, the magic doors start opening up for you. It's sort of like the universe can veer itself for you. So I met her and him and then they asked me to teach at the school. And it was sort like one magic door after another. You know, I'll be home soon! Erich: And I just kept going that way. And then Dad was fine. It's like, oh, Erich's making a living and he's doing OK. And he relaxed. Priya: I think I read somewhere that your perspective on death has changed over the years. Am I right? Has it? The vision fades, the light turns green, I keep driving. And part of me is thinking, you know, whoa, am I just tripping? Am I just making this up? I miss my father. And a part of me is going, whoa, whoa, whoa. [laughs] You know? And in his way he was sort of saying, “Hey, you're on a good track. Life is ongoing forever. Continue.” And suddenly, that began to shift my mind that there's no such thing as death. That life is ongoing and forever, no matter what. It is eternal. There is an ongoingness to things. Most of the planet believes in reincarnation, which is sort of giving testimony to the ongoingness of things. It's actually an ongoing, continuous morphing. Life only, always. Priya: What do you make of karma? Do you think one's actions create reactions as you go on? Erich: Up until a point. And then it's like you're subject to your current level of ignorance, is what it would be. It's not like, you've got to repay all your past bad actions. But as soon as you wake up to the truth, then the new karma that you'll be generating, like, you'll be free of the past. Priya: Do you think our grief response is unnecessary, then? Erich: I think it'll change. Definitely. Priya: But do you think, as it stands right now, the way people grieve death, do you think that there's anything productive, anything valuable in it? Erich: I've found value in it, as much as I think it also changes. Because the grief I felt, like the times that I felt it the most, it felt good to hurt that much, somehow. And it was sort of like in the sense of, it was nice that I was able to love that person as much as I did. And suddenly they're cut out of your experience, seemingly. I think we'll find that we're not actually cut out of one another's experience. And that as we're more awake, we will have contact with anyone, anywhere, always. And especially if we don't limit ourselves to being stuck here. We could go, you know, to visit them, come back. Go visit them, they could come here. Stuff like that, which happens now mostly in dreams or different people when they're meditating. But I think there's more interaction that is possible and will be more the norm, the more enlightened we are....so that we're not subject to our current level of ignorance. 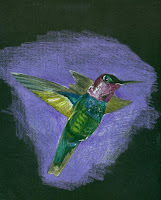 Priya: I saw a hummingbird the other day. Erich: You might see a lot here, actually. That might have been one right then. Did you hear that little sound? Priya: I heard that sound. Erich: I think that's a hummingbird, yeah. Priya: We don't get to see them in Toronto very much. It was just beautiful. It was outside the apartment we're staying at. And it was doing its thing, just hovering. But it's moving. And it reminded me of your idea of moving into stillness. And I wondered why you used that phrase as the title of your book. Erich: So the image is a spinning top, spinning so fast and so perfectly centered that it's like [hums]. Like, [hums]. Stillness and peace are the same. Usually when people think of the word peace, they think of maybe rest in peace. You know, like somebody dying or the top tipping over. Maybe rest in peace. Where as the word peace is usually associated with a lower energy state. And stillness, like a lower energy state. And I like the top analogy because it only appears perfectly still when it's perfectly centred and it's spinning so fast! It appears still. Where as if you weren't spinning quite so fast, if you weren't quite perfectly centred, you'd have this erratic spin. And most of us are not spinning at full speed, not perfectly centred. And we have an erratic spin. And we're sort of OK with it because at least I'm alive! You know, there's a lot of drama. And the thought is, rest in peace. Stillness is actually a higher energy state. That's what I like about it. It's a higher energy state! It's not a lower energy state. So moving into stillness is getting the hang of it by meditating. And you learn to do it in the asanas. And then you learn to do it all the time. 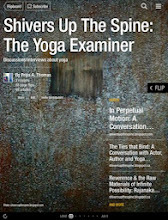 Priya: Do you practice both seated meditation and asana in equal proportion? Erich: I go through changes. Before, it was asana in a big proportion and the seated stuff in a smaller proportion. Now it's a bigger proportion of sitting. Like even when I'm doing my asana practice, the way it's been lately is I'll do a couple poses and then I'll sort of sit in lotus or some sort of lotus-y thing for a while. And then I'll do a couple stretches and sit in lotus for a while. But again, these days I don't really know what it's going to do. At the beginning, if I had been in that, I would've fallen asleep or taken a nap. It required the training, just like what we said before. Priya: Do you think that accessing the silent mind for yoga or meditation could be prescription for, you know, serious illnesses or depression? What's your take on therapeutic yoga in terms of very specific, serious applications to critical life situations? Do you feel that, for instance, in some cases only medication is the most useful alternative or solution to the situation? Or are you more inclined to say, well, this practice is enough to handle everything you've got coming? Is this the one-stop? Erich: Yeah, he's my favorite. People say it's a photograph. Like, he appeared to somebody and they took a photo. I like that. Priya: So would you call Christ your Ishta Devata? Your personal, chosen God or your deity? Is that how you would relate to Christ? Priya: Do you relate to the Bible as well? Priya: No? So it's the image of Christ? Erich: Yeah. Not the Bible so much, though it's probably fine. You know what I mean? Like when I get quiet or get online, you get online with other people who are online. And he's sort of the first one that shows up for me. And if I keep him in my mind, it helps me stay online. Priya: So I'm a little bit curious about something. You've been practicing for long enough that you would know that the messages you're receiving from online, are in fact, from online. But what about people out there who receive messages who would say they're "from online", and their visions are either horrific or just odd? How does one know for themselves whether that message is actually "from online"? And how can people discern? Erich: I know. That's hard. [laughs] It's hard. And I have the same sort of dilemma where I'll hear someone else saying that they're channeling something and it just sounds so not true. Like, how much can you trust to encourage someone else to dare to do as their deepest feelings guide them to do? The guy that just killed everybody in Norway. Wasn't he on a Christian mission or something? But it's like, "God told me to do it". At a certain point you can't let someone get away with that, if they're like walking around and shooting people. Even if they're God-inspired, supposedly. And so you've got to restrain them. So I don't know. My feeling is that the truest thing is good, God, love, loveliness, harmony, peace, higher energy state. That if people were perceiving clearly, they would be helping each other out. The world would not look like the enemy. And therefore, anyone that teaches you to "be afraid", or "get ready for", it just seems to me like they haven't quite hit a truer state. Priya: Do you think relaxation is kind of central to learning anything? Priya: When you look at students, can you identify a sensitive practice versus an aggressive practice? Is that something you do? Or do you try and remain neutral when you work with students? Erich: Well, it's interesting. I don't walk around lately. I don't give adjustments lately. Erich: I'm just trying to do what's feeling like the right thing. And now I go through seasons of it. Like, it always comes around again. But this season's been sort of a couple years of me hardly getting off the stage up there. Not giving adjustments. Hardly even looking at peoples' practice. But I've got a teacher training coming up. And if someone's teaching or practicing, I'll be watching them more closely and saying stuff. But I think my emphasis in class lately has been to just emphasize that no matter where you're coming from, just try to immerse yourself in your experience. You know, immerse yourself into the breathing. And that in itself, if someone does that, it'll get them more focused, if they need to be more focused. It'll make them softer, if they need to be softer. It' ll make them more energized if they need to be more energized. So I almost don't have to like say. Priya: So you really trust the practice, then? Erich: More and more and more and more, yeah. Priya: Do you know why it's such a powerful practice? You've come to trust it implicitly that it will do what a person needs if you're attentive to it. Erich: Well, yeah, because all you're doing is you're using your mind to be clear mind. And then however it's wanting to be will kind of show up. Priya: So could you potentially do anything else, rather than an asana practice? Erich: Yeah, right. Right. So sort of arbitrary that I'm doing this, so to speak. Erich: Well, some people are big meditators. Meditators usually don't do asana. Asana practitioners usually don't meditate. And yet they're both so good together. Like, if a meditator did more asana, it would really help their meditation, I think. And if the yogis would sit down and become still a little bit more, their asana practice would be up a level and be even better. They help each other. And the reason those two practices are good is because then it just helps you live your life better. And the whole thing, really, it's not about getting good at yoga, or getting good at the clarinet. It's about being a human being. A humane human being. I wonder how many clarinet players practice to become a better human being. I wonder how many people write books to become more humane. It doesn't take much observation to realize that years of discursive thought, professional accomplishments and a stack of half-decent yoga poses don't guarantee human development. This is where Erich would argue that if you are not growing, you are not online. Not that it's so simple. Getting online is onorous. But still, Erich, like any good teacher, seems un-phased. So as the days get colder here, and much of life seems busy and spinning, it does serve me well to remember Erich's idea that there's nothing wrong with taking time to suspend discursive thought. The thought-free mind, like that spinning top that Erich talks about, spins on its axis, with momentum, continuity, efficiency... its velocity an expression of human potential. So consider it a good omen that the grey streets grow quiet, and that the leaves you see take their time to tip, tilt and fall, suspended evenly in your periphery...and that all things move into stillness. 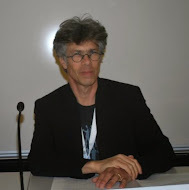 As a longtime admirer of Erich's and a once avid participant on his online forum, I have read a lot of interviews with Erich and a lot of his own writing. But nothing has touched me as deeply as this interview you did with him. I want to acknowledge your wholeheartedness as an interviewer and express my deep gratitude for sharing this with us. Nice. It feels so good to read. Keep posting. Do stay in touch. Wonderful interview. Thank you so much! This interview is beautiful, uplifting, inspiring, validating and totally refreshing. Thank you for shining this light so brightly. Wonderful interview. Thank you Priya. I have read Erich's story in his book which was great, but this interview is a beautiful addition to that because you were so "on the balance beam," "in the heart beam" and asked such good questions.